Although brown bears (Ursus arctos) don’t mingle much, the two depicted here have gathered at a stream near Canoe Bay, Alaska, lured by the first fish of the salmon run. Thanks to nutrient-rich salmon, brown bears on the Alaska Peninsula coast and islands are the largest terrestrial carnivores today, sometimes weighing over a thousand pounds. 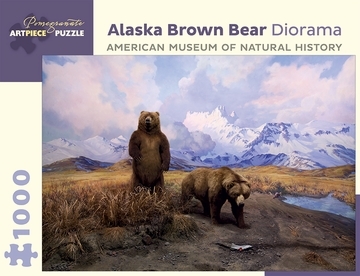 Brown bears live in the northern reaches of North America, Europe, and Asia, however those that live inland eat mainly plants—and can be half the size. Together, Alaska brown bears and salmon help support the riverside ecosystems they share.